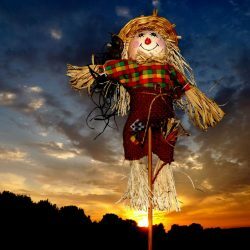 Reading, Pa. – The Reading Downtown Improvement District has announced that it will hold its annual Scarecrow Contest along Penn Street in center city. The contest is intended to engage businesses, organizations, clubs, families, schools and churches in a festive, colorful autumn event downtown. Entrants are encouraged to create whimsical, humorous, mischievous or lovable scarecrows, which will be put up for display the week of Oct. 9. To participate in this free contest, participants must register by Oct. 4. Registration information is available under the “Downtown News” tab on the Improvement District’s website, www.downtownreading.com along with additional information about the contest. For questions, contact the Improvement District’s office at 610-376-6424. The scarecrows will be judged the week of October 9 and first, second, and third place ribbons will be awarded. The Reading Downtown Improvement District is focused on creating a vital, productive and commercially active environment in downtown Reading. DID provides cleaning, security and marketing services for a specially designated commercial district in the city, and also sponsors several events and activities throughout the year, including MidDay Cafes, Reading Holiday Parade, and Reading Fire + Ice Fest. DID continually strives to make downtown Reading a cleaner, safer and more inviting place to live, work and visit.